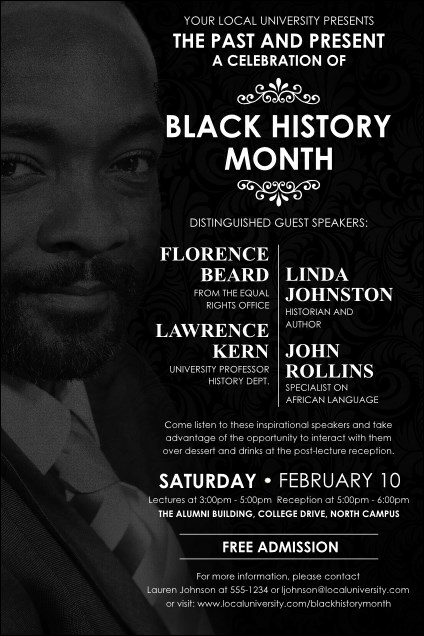 Cultivate well-deserved attention for your affair with a Black History Month Poster. Lavish respect on those who contributed to advancement with a cool white on black color scheme, a lacy design and the wise face of a dapper gentleman looking on. Praise your own event by proclaiming every detail on 33 lines ready for customization. Poster approximately measures 11.46" by 17.18"
Get the right poster from TicketPrinting.com.